My orthodontist told me that my upper eyeteeth are impacted, and that they will need to be “exposed” to move them into my bite. Can you please explain what this means and how it is done? Even if you don't know a lot of dental terminology, you can probably identify the upper canines. They are usually longer and pointier than the other upper front teeth. A smile without visible upper canines won't look exactly right. In fact, the canines are so important both aesthetically and functionally, they are sometimes known as the cornerstones of the dental arches. They are also called eyeteeth because, when they grow in properly, they are located under the eyes. 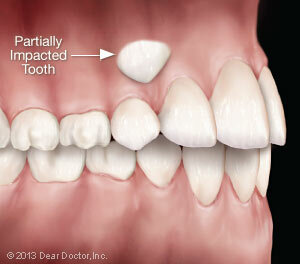 When they are impacted (blocked from fully erupting) as yours are, they may not be visible in the mouth at all. Fortunately, with the help of minor oral surgery and orthodontics (“ortho” – to straighten; “dont” – tooth), impacted canines can be exposed (uncovered) and moved into proper position. It is not uncommon for permanent (adult) teeth to be crowded, creating a malocclusion (“mal” – bad; “occlusion” – bite). Crowding means there is insufficient room for the teeth to erupt naturally into good alignment in order to create a good bite. Some teeth may actually become impacted, meaning that they grow and develop in positions that do not allow them to erupt (come into the bite) at all. Impacted teeth can develop abscesses, damage the roots of neighboring teeth, or become cystic over time. These issues are more commonly associated with wisdom teeth, which are often removed when they are impacted. Canines, however, are so prominent in the smile and so important to the bite, every attempt should be made to salvage and utilize them. The first step is to get an orthodontic evaluation of your whole bite, which includes not only the position of the impacted canine teeth but of all your other teeth as well — and your stage of growth if you are not yet an adult. This context is important in determining whether there is enough space to move the teeth into a proper biting relationship. The next step is to pinpoint the position of the impacted canine teeth. They generally can be found lying in the palate (roof of the mouth) or the facial (cheek) side of the teeth, buried in the bone above the gum tissues toward the vestibule — the place where the gum tissues curve into the lips. Determining their exact position is usually done by radiographic (x-ray) examination. Today's Cone Beam CT scanners produce highly detailed 3-D images that allow a dentist to assess whether orthodontics will be effective, or if the teeth are so far out of position that they cannot be salvaged and will need to be removed (and perhaps replaced with dental implants). If the canine teeth are in reasonable position, they will need to be exposed or uncovered so that the orthodontist can attach orthodontic braces to them and move them into proper position. If the canine teeth are in reasonable position, they will need to be exposed or uncovered so that the orthodontist can attach orthodontic braces to them and move them into proper position. This requires a minor oral surgical procedure, usually carried out by an oral surgeon or periodontist — the surgical specialists in dentistry. The surgeon will numb the area around the impacted tooth with local anesthesia and then create a small opening or flap in the gum tissue (comparable to the flap on an envelope) in order to see and gain access to the buried tooth. This flap will either be made in the palate or on the facial side of the teeth — whichever is closest to the crown of the tooth (the part usually visible in the mouth). If the crown is obscured by bone, a small amount will need to be removed to uncover it. Once the crown is exposed, the surgeon or orthodontist will bond a small bracket to it. The gum tissues are then sutured (stitched) back into position, and heal uneventfully. Attached to the bracket is a small gold chain, which loops over orthodontic hardware attached to the teeth. This mechanism will pull the impacted canine teeth into proper position over a period of several months. Exposing impacted canine teeth is thus a predictable, routine and very important way to retain these teeth and bring them into good functional and aesthetic positions.